Address: 111 N "E" St. Narrative: Crews responded to an automatic fire alarm in a school, and upon arrival determined that overcooked microwave popcorn had set off the alarm. Narrative: Firefighters investigated a possible prohibited outdoor burn of brush and tree limbs. Narrative: Firefighters responded to a reported house fire. The first arriving engine company found a small fire and smoke showing from the back of the one story with a basement single family home. Crews extinguished the fire that originated in some trim boards and fascia. The cause of the fire was improperly discarded smoking materials and there were no injuries to report. TFD was pleased to participate in a "mock" driving under the influence (DUI) demonstration today at Fife High School. At 1:00 p.m. a 9-1-1 call reporting a motor vehicle crash rang out over a sound system signifying the start of the simulated incident. The scenario: A head-on two car motor vehicle crash caused by an inebriated high school driver. The outcome: one patient trapped in their car requiring the door to be cut off to free them, one patient being transported by helicopter to an area hospital, one occupant dying at the scene, and one person arrested for driving under the influence. Following the Every 15 Minutes program format, Fife Police Department coordinated the demonstration and participating agencies included Tacoma Fire Department, Airlift Northwest and the Pierce County Medical Examiner office. With high school students celebrating at their prom and graduation parties over the next few weeks our message is simple: PLEASE - DON'T DRINK AND DRIVE! Narrative: Fire sprinklers credited with extinguishing kitchen fire. Firefighters responded to a reported apartment fire, and upon arrival they found a fire had started in the kitchen of a fourth floor unit. The buildings automatic fire sprinkler system activated and extinguished the fire before it spread, significantly reducing the fire and smoke damage to the building. Once it was determined that the fire was out, crews concentrated their efforts on removing the water from the apartment of origin and from those below it. All occupants escaped without harm and there were no injuries to report. Narrative: Crews extinguished a 20 x 20 brush fire with booster line and tank water. Address: 1311 S. Sunset Dr. Address: 2141 S. 46th St. Narrative: Firefighters responded to a brush fire and used a booster line and 500 gallons of tank water to extinguish the fire and wet down the surrounding area. Address: 4115 N. 21st St. Narrative: Firefighters responded to a reported kitchen fire. The first arriving engine company found light smoke showing and determined that an unattended pan of oil had overheated and caught fire. The occupant extinguished the fire prior to our arrival and crews assisted with smoke removal. Address: 3621 E. "J" St. Narrative: Firefighters responded to an outdoor cooking fire that was too close to combustible material. Narrative: Firefighters responded to a reported commercial structure fire. The first arriving engine company determined that it was a small exterior beauty bark fire and crews extinguished the fire. Address: 220 N "I" St. Narrative: A single engine company was dispatched for a report of smoke in the area, and upon arrival they found a fully involved garage fire. A full 1-11 response was added to bring additional firefighters and equipment to the incident. Firefighters attacked the fire, protected exposures and confirmed no one was in the garage. 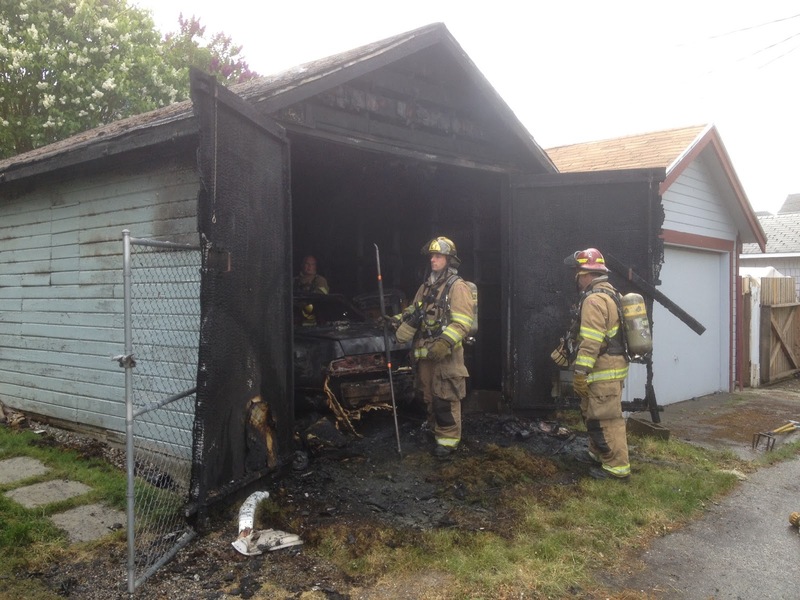 The fire caused heavy damage to the building and automobile inside, with minor damage to a adjacent garage. The cause of the fire was undetermined. Narrative: Firefighters responded for a reported kitchen fire. The first arriving engine company found smoke showing from the 1 1/2 story 1,217 square foot single family residence. Crews mounted an aggressive interior attack on the fire that had started from an unattended pan of oil on the stove and expanded to the cabinets and ceiling of the kitchen. The fire was contained to the kitchen area, all occupants escaped safely, and 8 were displaced due to the damage. Narrative: Crews extinguished a fire that started on an exterior deck of the single family house. The fire was contained to the deck before it could spread to the house and all occupants escaped safely. Improperly discarded cigarettes was the likely cause. Narrative: Firefighters responded to a reported dumpster fire. The fire was extinguished with a dry chemical extinguisher by a passerbyer prior to arrival. Narrative: Firefighters responded to a reported grass fire. Crews arrived to find a small smoldering grass fire, and extinguished it with a booster line. Narrative: Food left on the stove caught fire and charred upper shelving. Crews extinguished the fire, shut off the gas, and opened the wall behind the stove to assure no fire extension. Narrative: Prohibited outdoor burn of garbage.